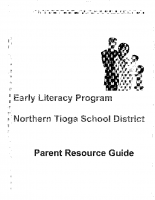 The Northern Tioga School District Board of Directors adopted a goal in 2003, as proposed by the Academic Initiative’s Committee to begin an Early Literacy Program in the district. The goal was to promote reading to pre-school youth. The district believes that success in school starts with reading. However, children develop the reading readiness skills they need for success in school from birth through preschool years. Parents are truly a child’s first teacher. To begin the process a partnership was established with the Soldiers and Sailors Memorial Hospital in Wellsboro, Cole Memorial Hospital in Coudersport, Corning Hospital in Corning, Robert Packer Hospital in Sayre and Arnot Ogden Hospital in Elmira. 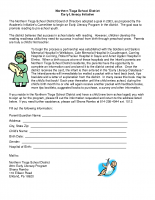 When a birth occurs at one of these hospitals and the infant’s parents are Northern Tioga School District residents, the parents have the opportunity to complete an information card and send it to the district central office. Once the district receives the card, the infant is then entered in the “Early Literacy Database.” The infant/parents will immediately be mailed a packet with a hard back book, tips booklets and a letter of explanation from the district. In many cases this book may be the child’s first book! Each year thereafter until the child enters school, during the child’s birth month he or she will again receive another packet with hardback books, more tips booklets, suggested books to purchase, a survey and other information. If you reside in the Northern Tioga School District and have a child (new born-school aged) you wish to sign up for the program, please fill out the form below and return it to the address provided. If you need further assistance, please call 814-258-4544 ext. 1012.